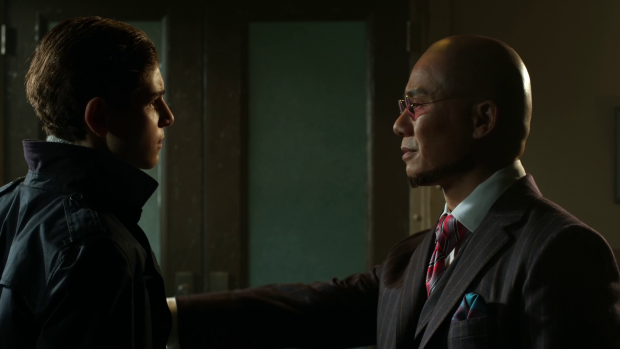 The penultimate episode of season 2 of Gotham features returning characters, a new villain and a shadowy threat manipulating events from behind the scenes. Aaron is unavailable this week so the duty of reviewing Gotham falls to me. I haven’t done this since season 1 so in many ways it’s interesting to put my reviewer hat on for the first time in season 2. I wasn’t the biggest fan of Gotham in season 1 for many reasons that I won’t go into here but I do think that the second season has been a vast improvement on the whole. Not having to review it has let me enjoy it a lot more as well. As with many episodes of this show there’s a lot going on and it’s difficult to figure out where to start so I’ll begin by discussing the return of Fish Mooney. Her character was one of the stronger aspects of last season in the beginning but descended into being completely pointless when she was off having another story that didn’t connect to the rest of the show at all. Her death had no real consequence other than giving Penguin an opportunity to take her place in Gotham’s criminal hierarchy. 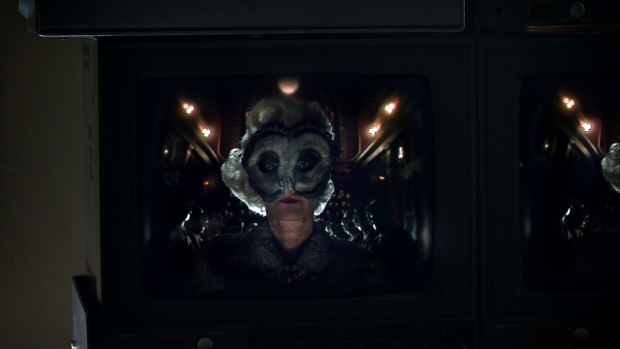 To me her return feels like a stunt only performed to have that dramatic reveal of her face as Hugo Strange’s next experiment. Once that shock wears off it becomes painfully apparent that she hasn’t actually been brought back for any reason other than have a familiar face associated with the overall story. Using Theo Galavan as Azrael worked for me because he was a character developed over the early part of the season with a connection to the order of St. Dumas that informed the Azrael persona. It all comes together in meaningful ways because the work has been done to develop it whereas the return of Fish Mooney is exactly the opposite – a random event meant to encourage a shocked reaction from the audience. It does feed into Hugo Strange’s larger plan to successfully reanimate a dead person with their memories and personality completely intact and Fish represents the first true success of his experiments but the effect could have been accomplished with any character. I feel that this would have been a good way to use Mr. Freeze instead of turning him into a henchman or Azrael could have had a much larger arc focused on a fluid sense of identity. 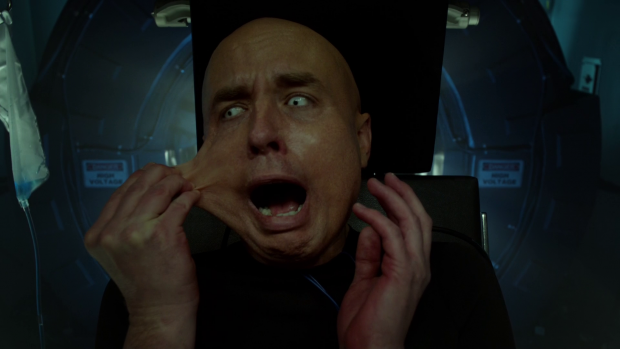 Instead we have Fish Mooney who has had her DNA spliced with that of a Cuttlefish so that now she can manipulate people into doing her bidding simply by touching them. This also strikes me as a lazy way of having her easily control other people which isn’t really necessary as the one character attribute that was well developed in season 1 was how well she could manipulate people. In future any intelligence her character has in finding the weaknesses of others to get them to do what she wants is gone because she can do it by touching them now. That’s a lot to say about a character who doesn’t actually do anything in this episode but I feel like I know where they’re going with this and I can see Fish using her powers to try and climb up the criminal ladder in Gotham again. 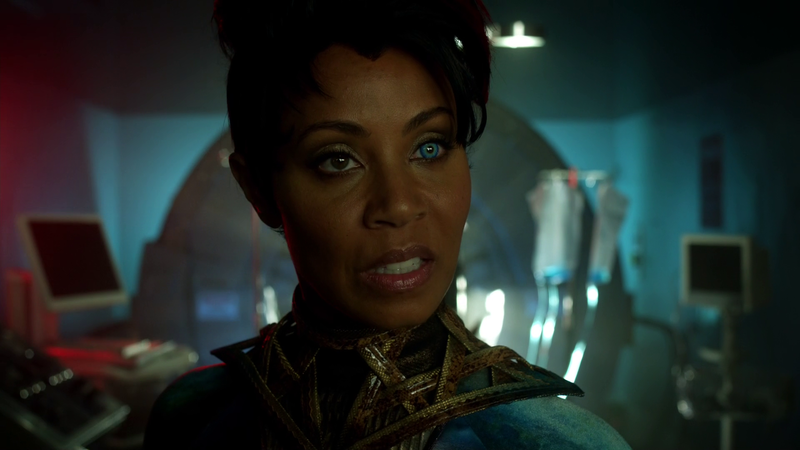 I have no idea how long Jada Pinkett Smith will be around in terms of how many episodes she has signed up for but it wouldn’t be the first time Gotham has resolved a story arc far too quickly. It is revealed that Strange is working for the Court of Owls who are very disappointed in his results so far. They call him out on how sloppy he has been by unleashing Azrael and Mr. Freeze who both lead back to him without much investigation. I find it odd that Strange is written and performed as a meticulous person who even chooses every word he says carefully yet his plans seem so reckless by comparison. Sending Azrael out when he wasn’t sure that he could be controlled was definitely a mistake and I’m glad that his superiors call him out on this. It’s clear that he’s starting to outlive his usefulness to him as his resurrection experiments aren’t providing the results that they should be. The success of Fish coming back to life with her memories intact is a card that he can play to be kept around a little longer but how long until that proves to be a failure by their standards too? I imagine this introduction is to function more as a setup for a more significant presence next season and so far it’s enough to at least qualify as interesting. It shows a deeper mythology at work, creates a question over why they want Strange’s resurrection experiments to be a proven success and shows Strange in a different light than we have seen him so far. Linked into this in some way is Bruce’s concern over Selina not returning from Arkham. He rightly concludes that she must be in trouble and takes it upon himself to find a way to save her. As far as he’s concerned it’s his fault that she’s in this mess and it’s up to him to fix it. Luckily he has Alfred, Lucius and Gordon to back him up in his crazy plan. Alfred is initially against it but goes along with it as it’s the best way to ensure that Bruce remains protected. They have a really good conversation where Alfred realises that Bruce is too much like his father which gives him two choices. Alfred can either spend the rest of his life going to extreme lengths to stop Bruce or he can support him and do what he can to make sure that he comes out the other side in one piece. This is a good foundation for his reasons for expanding this role when Bruce becomes Batman later in life. This plot allows Bruce to practice another important skill he will use in his future as Batman. An important part of his effectiveness as a crime fighting vigilante is that Bruce Wayne has to be believable and we see some of that persona start to develop through is interactions with Hugo Strange. He pretends to be at Arkham for business reasons which is enough to get him in the door. Once he’s there he has to act as if he has no other agenda. Strange makes that difficult by using his connection to Bruce’s father to provoke an emotional reaction. David Mazouz’ performs well in these scenes. There’s a lot of subtlety to his performance as Bruce tries to keep up his confident persona while feeling uncomfortable at the mention of his father. It’s good that Bruce hasn’t figured all of this out yet and it’s enough that he realises that this is something that he will need. I like that this aspect of Batman is being explored as I’ve always found the perfectly cultivated Bruce Wayne persona to be an interesting part of the character. Strange’s side of the conversation is really good as well. Despite the fact that he was probably responsible for arranging the deaths of Bruce’s parents it seems like there is some regret that he felt he had to do that. B.D. Wong projects genuine affection for Thomas Wayne which adds a complexity to that relationship we’ll never see while deepening his connection to Bruce. The plan that Lucius and Gordon come up with is incredibly dumb. 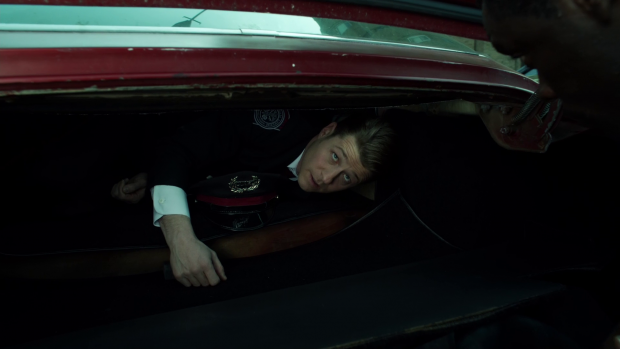 When Lucius asked Gordon if he could find his own way in if Lucius got him through the gate I expected something more intelligent than hiding him in the trunk of his car so that Gordon could try to blag his way in using his old Arkham idea. Lucius wandering around with a device that makes noise in the presence of a secret door also seems doomed to fail so it’s no surprise when it fails miserably, leaving Bruce and Lucius at the mercy of the Riddler. Gordon’s situation is no better as Lucius reveals his latest creation in the form of Clayface (Brian McManamon) who disguises himself as Gordon for some unknown reason. I’m guessing it’s an attempt to gain easy access to Bruce but we’ll see. As cliffhangers go it’s not all that exciting but it may lead to something interesting. Selina has really grown as a character this season and Camren Bicondova has definitely grown as an actress. Her role in this episode was a bit dull but Camren Bicondova’s performance massively elevated the material. Selina’s affection for Bridgit came across as completely genuine and weight was added to the situation through the power of her performance. Having her position herself as Bridgit’s servant in order to keep herself alive is entirely consistent with Selina’s character. She has always been a survivor through any means necessary so it’s certainly believable. I really like seeing Bullock in a leadership role. He is completely overwhelmed by the situation but refuses to let anyone except Gordon know. He doesn’t do much in this episode in terms of the overall plot other than mobilise his people to go into Arkham showing how he realises his power comes with some advantages. Seeing him deal with the media was great too. I loved his answer to the question of Azrael’s identity – “Well seeing as how the suspect is now meat dust, a positive identification would be difficult.” as well as his “which time?” response to the question of who killed Galavan. Bullock is still the best thing on this show. The episode definitely benefits from a tighter focus on Gordon, Bruce and Strange but the show hasn’t quite managed to shake the tendency to feature too many characters at once. There was no real need for Nygma or even Selina as their scenes dragged down the overall pace of the episode. Some habits seem to die hard for the producers of this show. This episode has some good and some bad which seems to be the mission statement for Gotham in my experience. The return of Fish Mooney feels entirely pointless to me but the introduction of the Court of Owls and Bruce starting to cultivate the businessman persona are nice touches. Bullock also entertains as he gets used to his role as acting Captain. Clayface impersonating Gordon doesn’t make for the best of cliffhangers but it remains to be seen what is done with it in the finale. Aaron will be back next week for the season finale. He definitely likes this show more than I do but this episode had some things to recommend.